John J. Dougherty speaks during a protest outside of a non-union construction site at 401 Race Street on Thursday. No more keeping quiet for Local 98 of the International Brotherhood of Electrical Workers and the Philadelphia Building and Construction Trades Council. John “Johnny Doc” Dougherty, leader of both, on Thursday painted 2019 as his return to public prominence. And he did it with a retooled holiday song, accusing a developer of building mold-blighted, high-end apartments with mostly nonunion help, of course. Local 98 had retreated from its pugnacious publicity stunts in recent years as federal investigators probed the union’s business dealings, tapping telephones for Dougherty and others. New Year, new tactics, Dougherty declared. There has been widespread speculation that 2019 could be a jolting year for Local 98. But Dougherty, who also receded from public view while dealing with his wife’s longtime health issues, sees only good news as the calendar flips over to 2019 on Tuesday. Thursday’s publicity stunt, well-attended by reporters in a notoriously slow week for news, found Dougherty and about 50 union leaders and members standing at Fifth and Race Streets, listening to a performance of “Baby, There’s Mold Inside,” sung to the tune of “Baby, It’s Cold Outside.” Behind them, a four-story, 216-unit apartment building was being constructed by mostly nonunion workers. 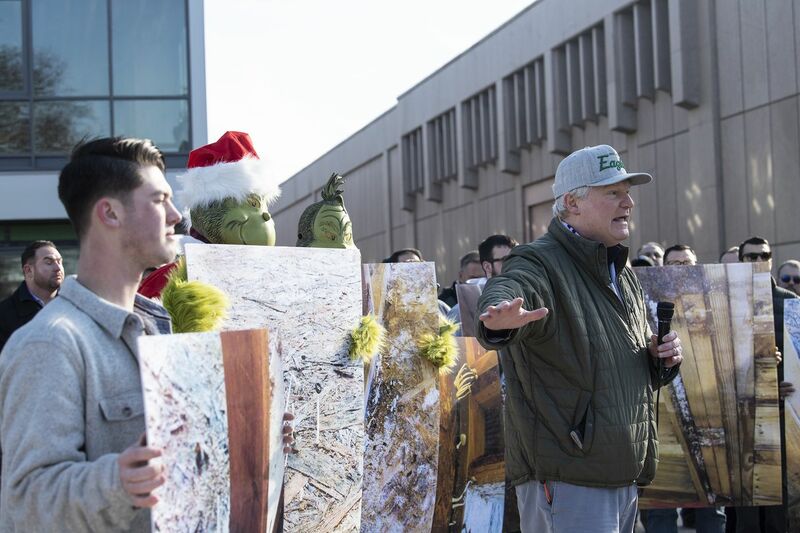 The singers were backed up by men in Grinch masks and Santa suits, holding poster-size pictures of what Dougherty claimed were moldy conditions photographed inside the construction site by union spies working on the job. Dougherty, who played a significant role in helping Mayor Jim Kenney win the 2015 Democratic primary, repeatedly said the mayor listens to union concerns even as his administration is slow to act on them. Speaking of that, a term common to federal investigations found its way into Dougherty’s explanation. Clout hears State Rep. Daryl Metcalfe is angling to become chairman of the state House’s Judiciary Committee. Metcalfe is an ultra-conservative Republican from Butler County’s Cranberry Township, 18 miles north of Pittsburgh and 266 miles west of Philadelphia. But he’s been known to live rent-free in the antagonized minds of progressives across the state. He bragged earlier this year about using his post as chairman of the House’s State Government Committee to "block all substantive Democratic legislation.” He also flirted on social media with a conspiracy theory about a school shooting in Florida in February that claimed 17 lives. And there was that time last year when he freaked out because a Democratic colleague touched his arm. Metcalfe, with two decades of accumulated seniority, has the pull to land the Judiciary chairmanship. But only if House Speaker Mike Turzai, who is expected to win another term in that post on Tuesday, selects him for the post, which is vacant because the last chairman, State Rep. Ron Marsico, a Harrisburg Republican, did not seek a new term this year. Metcalfe, who didn’t respond to our hails, holds a gun-rights rally at the Capitol every year. Any legislation impacting gun owners would have to pass through the Judiciary Committee. He took to social media in June to assail the committee for “legislative shenanigans and sleight of hand” after it narrowly voted to outlaw rapid-fire “bump stocks” that can make a semi-automatic rifle fire similarly to an fully-automatic rifle. The legislation later stalled in Harrisburg but President Donald Trump’s administration earlier this month moved to ban bump stocks nationwide.